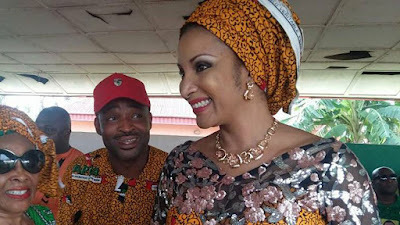 Bianca has been leading campaign for the resignation of the APGA national chairman after she contested and lost the party’s primary election for Anambra South Senatorial district. Bianca had condemned the conduct of the primary election and called for the reformation of the party. Speaking with journalists on Friday, Oye said Bianca had not been fair to him or the party in spite of the support and privileges she enjoyed during primaries. Oye said, “I deserve an apology for the misplaced and unwarranted attacks on me by the wife of the late Dim Chukwuemeka Ojukwu. “That she is a widow does not confer on her a special status. It is not in APGA constitution that once you are a widow, we give you a ticket. “I don’t think it is in the constitution of any party in Nigeria that once you are a widow, you get an automatic ticket. The APGA national chairman observed that Bianca’s attacks on the party could be considered as anti-party activity. He said, “Bianca is my personal friend and there is no way I could have done any wrong against her. “I did not do anything to Bianca. People were sent to conduct the primary election and they returned results to me and that was all I cared about. “That is why I said she should tell us why she lost. I will even question her later so that she can explain to me why she lost after all the support we gave her. “She calls herself Mother General of APGA, but as a mother, she should not be castigating the party like that. Meanwhile, Bianca, in Owerri, on Friday, called for Oye’s immediate resignation. Bianca made the call at the 2018 edition of the Ojukwu annual lecture, organised by the Movement for the Actualisation of the Sovereign State of Biafra/Biafra Independent Movement. She alleged that there were irregularities in the party’s primary election for Anambra South senatorial district. She expressed regrets that although all APGA aspirants had the late Ojukwu’s photographs on their vests and posters during the electioneering period, what was due to his (Ojukwu’s) family was diverted by the party’s leaders. In another development, the MASSOB/BIM leader, Chief Ralph Uwazuruike, said Igbo should not vote for APGA in the 2019 elections.